Follow these steps to get subscription messaging permissions and user profile information. Update: Facebook has indefinitely extended the subscription messaging deadline. We encourage you to complete this application anyway and we will continue to update you on Facebook's policies. Subscription Messaging permissions allow you to send regular, non-promotional messages to your user base, creating opportunities for ongoing engagement and promotional follow-ups! Facebook is going to update its policies around subscription messages. Previously, the ShopMessage App had permission to send Subscription Messages for all its customer. However, Facebook is moving this permission to the Page-level. 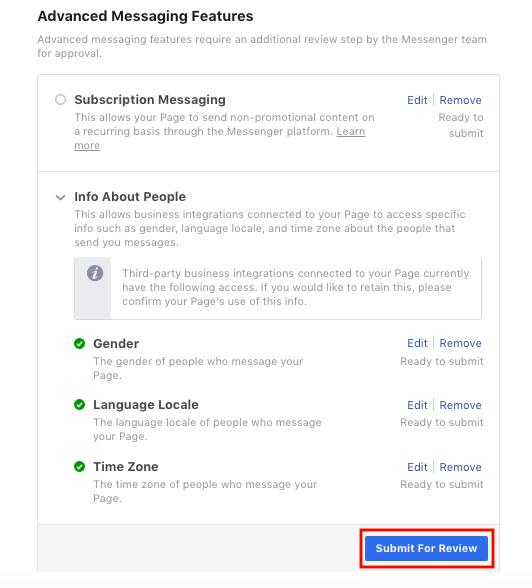 You will need to request access from Facebook for your Page to use the subscription messaging feature. This Facebook permission is required if you plan to use the ShopMessage Broadcast Campaigns feature to send manual broadcasts. Don't worry, this request takes just a few minutes to complete and we've outlined all the steps that you will need to take. Subscription messaging allows you to send non-promotional content to your contacts on a regular basis. Just as you would in email, establishing a regular campaign schedule and building a subscriber list is crucial to your Messenger Marketing success. The best part is after a user responds to your message, you can then send a promotional message as a follow up! Info about people permissions are important so your page can access information about users who have sent you messages. 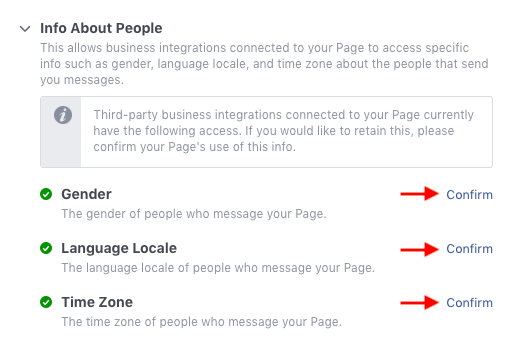 With these permissions you can segment your audience and personalize messages based on user gender, language and timezone. 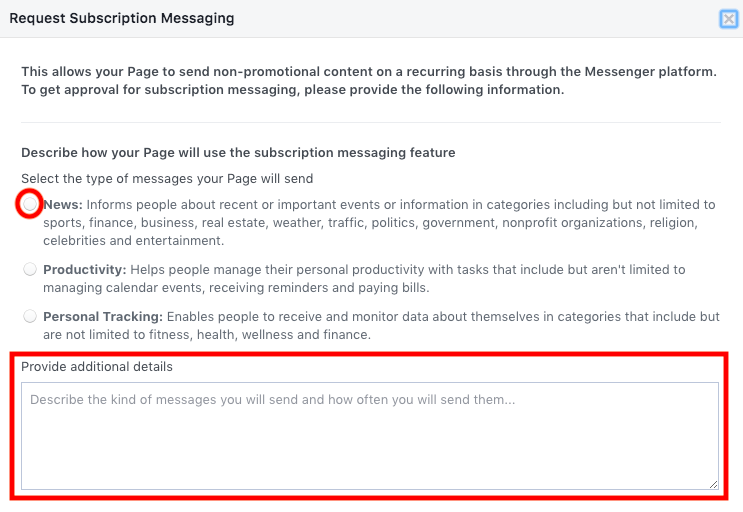 Facebook is updating it's policies around subscription messaging, moving permissions from the app-level to the page level. In short, this means you need to apply for subscription messaging permissions by December 31, 2018. You can read more about this update from Facebook here. Under Subscription Messaging in the Advanced Messaging Settings section, click the Request button. Select News as the type of messages that your page will send. In the Provide additional details section describe the types of messages your Page plans to send along with the frequency. If you plan to send blog update alerts or news about industry trends once per month include that here. Include two or more Examples about how you plan to use subscription messaging. Do not include examples that contain promotional content. Your examples should be relevant to your industry and store. Consider including the type of content you might share on your Instagram or Facebook Page that provides your user with helpful or useful information. Veterans Community Project is building tiny houses for your favorite vets. Want all the details? Visit our site! 10 new diet tips to help you push your workout to the next level, click the link below to check them out. Having a ruff day? We have some of the silliest dogs of the year to cheer you up! Click "pup pics" to see these good boys. Finally, check the box to confirm that your page will only send non-promotional content, and will abide by all Facebook Platform policies and community standards. Now, click Save as Draft. Facebook is updating the Info About People permissions from the app-level to the page level, meaning you need to apply for access to these features as well. Within the Advanced Messaging Settings section, click the Info About People to expand that section. One at a time click on the Confirm link for Gender, Language Locale and Time Zone. After you've clicked a Confirm link a new window will pop up prompting you for more information about how you'll use this information. Gender: My page would like to access user genders to include proper pronouns and personalized product recommendations based on gender. Language Locale: My page would like to access user language locales in order to correctly display numbers, times and dates or communicate with people in their preferred language. Time Zone: My page would like to access user time zones to avoid sending push notifications in the middle of the night. Once you've updated each click Save Draft. Click Submit for Review to send your application to Facebook! The review process make take up to five business days. You must do this for every page that you would like to send subscription messages from. If you have questions, we're here to help! Just use our in-app chat window or email us at [email protected]!